For Unbeatable strength and easy handling, go with the breakthrough technology of Sufix Elite. This line has Superior tensile and knot strength due to Micro Resin Technology and has all-around exceptional performance! 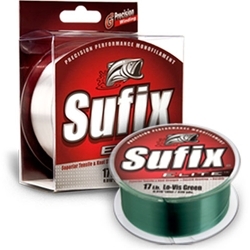 The Sufix Elite Series handles better and casts with ease due to it's proprietary extrusion process and the exclusive G2 Precision Winding virtually eliminates line memory.